Some people making New Year’s resolutions and others do not. When affluent investors make financial resolutions, they consider the events of the last year and look forward to making the next year more profitable. Spectrem asked more than 900 affluent investors to list their financial New Year’s resolutions for 2016. The answers show that the classic “save more’’ plan is still as popular as ever. The investors were asked to rate financial New Year’s resolutions on a 100-point scale, with “0” indicating it is not very important and “100’’ indicating that it is very important. While the top choices seem standard and expected, investors responded in a surprising fashion when asked about considerations for estate planning. “Save More” topped the list as the most popular resolution, drawing a rating of 61.87 overall. But there were clear differences in even that simple investment strategy among different segments of investors. For instance, females rated “Save More” at 65.90, while men had it at 57.37. Investors with a net worth between $100,000 and $500,000 rated “Save More’’ at 70.96, while those with $5 million plus in net worth rated it at 48.23. There was a large spread between investors who are working and those who are retired in terms of plans for saving more. The retired investors rated “Save More’’ at just 51.12 in terms of importance, while those still working had it very high, at 67.76. Based on occupation, Business Owners rated “Save More’’ at 63.76, while Senior Corporate Executives had it much lower, at 48.32. Age played a role in the savings plan as well. Investors under 40 rated “Save More’’ at the very high number of 73.23. Those over the age of 60 rated it at 53.91. The next most popular resolution was “Spend Less”, which is not the same as saving. Overall, investors rated “Spend Less” at 56.51, with the same variations based on gender, net worth, retirement status, and occupation. One variation came in the results based on age; investors between the ages of 41-50 had “Spend Less’’ at the top of the chart at 65.09 (perhaps as they look to paying for college for their children). While saving more and spending less are standard choices for New Year’s resolutions, investors also plan to deal with their debt situation. “Pay Down Debt’’ was rated at 52.24, and of course that plan was rated higher by those with lower net worth and the younger investors surveyed. The surprise choice for the fourth most popular resolution was “Revise or Create an Estate Plan”. 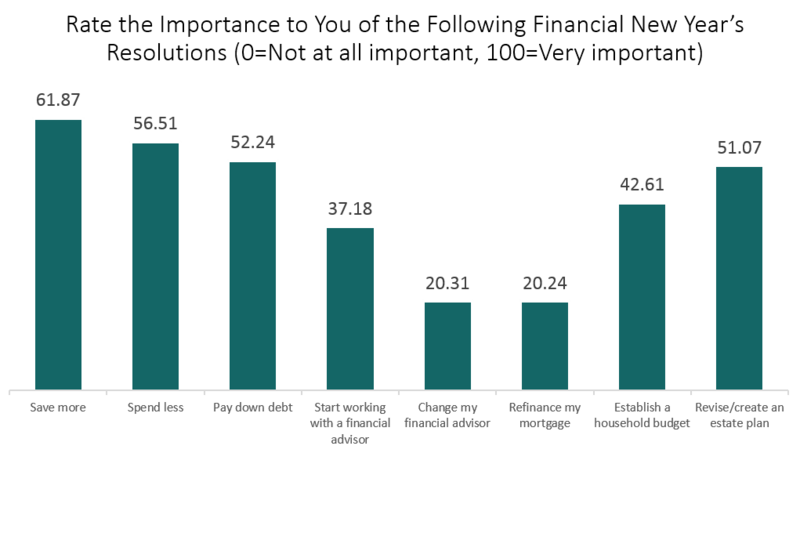 Overall, investors rated that choice at 51.07, and Corporate Executives topped the list, rating it at 59.33. Unmarried investors ranked it at 55.48, well above the married investors, who had it at 50.25. Financial resolutions that did not make the middle mark of 50 were “Establish a Household Budget” at 42.61, “Start Working with a Financial Advisor’’ at 37.18, “Change My Financial Advisor” at 20.31 and “Refinance My Mortgage” at 20.24.